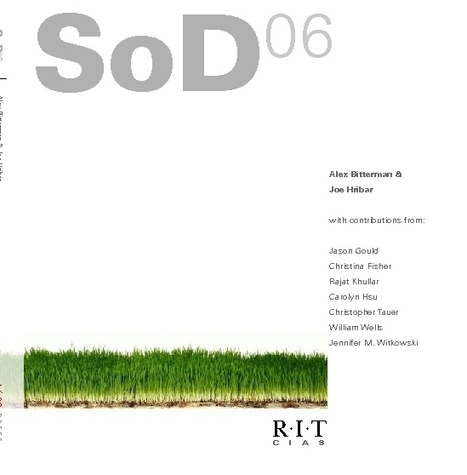 I served as a co-editor and a contributor to SoD 06 (School of Design). The book features student essays from a Design Issues course at RIT in the fall of 2006. The book is available at Lulu. Proceeds from the book go to help fund future RIT class publishing. Instead of a front seat, hands-on approach to the situation, the federal government is merely providing states the funds to acquire electronic voting equipment. Through the Help America Vote Act of 2002, passed by Congress after the punch card nightmare in the 2000 presidential election, the federal government is forcing states to buy the equipment to replace older voting technologies, such as punch cards and lever machines (U.S. Election Assistance Commission). Indeed, the federal government is forcing states to buy into a faulty, untrustworthy product, a product with the capability of severely crippling our democracy. Given these high stakes, actions to solve the numerous security and verification problems of electronic voting machines must be a top priority for the federal government and every citizen. Several academic and state-commissioned reports have cited the gaping lapses in adequate technological development of electronic voting machines. Until those lapses are resolved and the federal government provides guidelines and standards for the use and manufacture of electronic voting machines, the machines should not be approved for use in conducting elections. The current machines administering the elections cannot be trusted to provide accurate election results, and if the machines cannot be trusted, then neither can the elections.